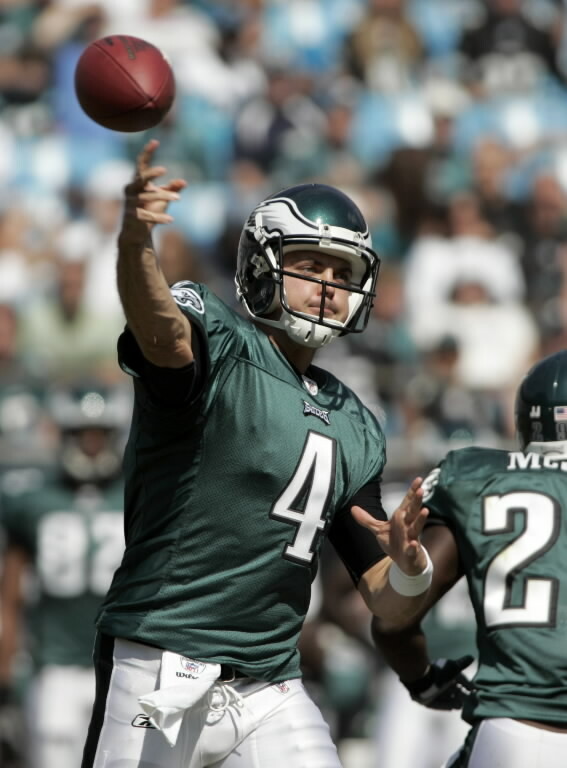 25 year-old quarterback Kevin Kolb will have major shoes to fill in his new starting role in Philadelphia following the trade of Donovan McNabb to Washington. It has been more than five years since the Philadelphia Eagles were led to within a field goal of a Super Bowl victory on the shoulders of all-pro franchise quarterback Donovan McNabb. Despite the Eagles’ resolve which allowed the team to bounce back to achieve their best record since the 2004 season, time and chances were set to run out shortly with age and injuries taking their toll on the core players of the Eagles franchise. Donovan McNabb, 33, was plagued by a number of injuries in the three years following the Eagles’ run to the Super Bowl in 2004; spending the final seven games of the Eagles’ disappointing 6-10 season in 2005 on injured reserve, and again sitting out the Eagles’ 27-24 NFC division round playoff loss to the New Orleans Saints at the Superdome in January of 2007. Although Philadelphia Eagles team officials remained relatively quiet regarding the possibility of a trade involving Donovan McNabb in the days leading up to the recent transaction, the combination of factors involving age and injuries made the likelihood of a trade all but inevitable for a number of analysts—especially with the February 23 release of long time Eagles backfield staple Brian Westbrook after an injury marred 2009 season. In return for Donovan McNabb, the Eagles will receive a second round pick in this year’s NFL draft from the Washington Redskins, and a pick in the third or fourth round of the 2011 draft. Immediately following the announcement of the trade came the announcement that Philadelphia’s 25 year-old second string quarterback Kevin Kolb will take over the starting job for the foreseeable future. While some may view the recent trade of Donovan McNabb as a necessary step at this stage for the franchise to provide a window of new possibilities, it is only reasonable to expect that this adjustment process—as with any—will involve its share of tough times ahead in the coming seasons for the Philadelphia Eagles. For any successful sports franchise comes a time when it is necessary to reconstruct the foundation upon which the franchise builds its success with new pieces, and for the Philadelphia Eagles, it appears that the possibility of building for any further success upon the foundation of the last half decade was no longer a feasible one.